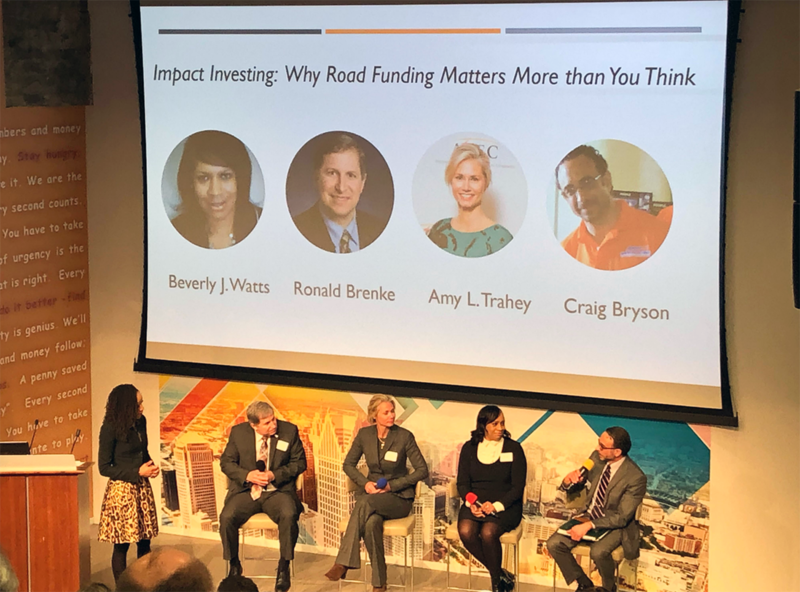 DETROIT – Michigan’s crumbling roads need fixing and it’s going to cost a pile of money, a number of road experts said Thursday during discussions that outlined the scale of both the problem and solution. Though most residents may not like higher taxes, they’re going to pay to either fix the roads or the cost of lost productivity, broken rims and wasted time that will continue to haunt Michigan unless the roads’ problem is solved, they said. With 25 percent of Interstate and main state roads in poor condition but nearly half of all other roads similarly bad, panelists said state leaders must find a solution or risk that the situation will quickly get worse. “The need is tremendous,” said Craig Bryson of the Oakland County Road Commission. The discussion, a “Solutions Summit” sponsored by The Center for Michigan and Crain’s Detroit Business, made clear that experts confirm what so many Michigan drivers have long experienced: the state’s road and bridge network is in disrepair and needs a shocking amount of money – anywhere from $2 billion to $2.5 billion more a year. That would mean spending another $200 to $250 per person annually. But if that money isn’t found, the bill to fix cars from damage – now estimated at nearly $650 per driver – will only rise. “You’re going to pay,” said Beverly Watts, director of public services for Wayne County. Watts and Bryson were joined by other road, political and research officials from around the state at Thursday’s discussion, held at the M@dison Building in downtown Detroit. About 65 residents from across the region attended the event, answering questions about how they felt about roads and how they would fix them. Gov. Gretchen Whitmer, a Democrat, has proposed a 45 cent increase in the gas tax, which would raise an estimated $2.5 billion a year and give Michigan the highest gas tax in the country. Many have balked at the cost, including a number of Republican leaders. Part of the reason some residents are upset is the Legislature and former Gov. Rick Snyder already raised gas taxes and vehicle registration fees in 2015. But that money just went toward the most heavily traveled roads like the interstate system and state highways, panelists said, leaving huge unmet needs on other roads across the state. Whitmer’s plan comes just a few years after motorists already saw their taxes and registration fees rise. That undermines their trust in lawmakers, panelists said. “People don’t understand we didn’t fix the problem,” said Ronald Brenke, executive director of the Michigan chapter of the American Society of Civil Engineers. As a result, leaders in Lansing will need to undertake a campaign to educate state residents that what they ultimately do will address the issues and justify that potential $250-per-person bill. Christopher Douglas, an economist at the Flint campus of the University of Michigan, said residents remember the 2015 tax increase and now they’re being told “it’s not enough. “For those reasons I’m not sure they’ll want to pay the 250 bucks,” he said. That distrust has created a hurdle, panelists admitted, and an opportunity for that education campaign. Residents have to be reminded they are already paying for dilapidated roads. Eric Lupher, president of the nonpartisan Citizens Research Council of Michigan, said even farmers are getting hurt when fruit gets bumped and bruised as it heads to market along pock-marked roads. Two more panel discussions are upcoming in Lansing on April 19 and one in Grand Rapids on April 28. Download a PDF of Chad Livengood's introductory presentation. get the money back out of the general fund and raise the taxes in metro to fix metros roads. if they get 47% of the money, they should pay the most. the Gov doesn't even know that we live anywhere but the cities. Why is there no discussion of adding tolls, particularly on our major highways? We pay tolls on the 80/90 turnpike. We pay tolls on I-65 to cross into Louisville and back. We pay tolls to get to Chicago. Why not charge tolls on I-75, 94, 69, etc? Want to fix the roads? Recently our Senators have proposed a continuation of the electric car tax incentive. IMO, what a waste. Let's face it, not only are Michigan's roads lousy, so are many others nationwide. It's considered political suicide to raise any tax. But the truth is, vehicles do use less fuel these days. That equals less fuel tax revenue. Simply raise the national fuel tax rates and return the proceeds back to states where it is generated proportionally. If fuel taxes go up, there's no need to "give" tax breaks to electric vehicle purchases. Our Governor ran on making sure our gas tax and sales tax on gas goes to the roads as it should. We already pay near the highest in the nation gas tax , one of the few to also charge sales tax on gas and get the lowest percentage of these taxes directed to the roads as Widmer promised. Why would we trust her with additional taxes when she has not fixed the exisiting situation??? Governor Whitmer has been in office for only 100 days. The legislature is controlled by Republicans. Any type of politically realistic proposal to fix our roads is going to take oth time and a willingness on all sides to make concessions and abandon long-held dogmas to get anything done. I would be more inclined to support a raise in gas taxes that didn't perpetuate more "shell games", as Gov. Whitmer has called them. We should start by removing the sales tax on gasoline, which very few other states charge. Next, raise the gas tax, but only by 30 cents, in 3 ten cent increments, maybe as fast as 18 months and maybe more like 24 months. Now add a penny a mile road maintenance charge for all EVs and HEVs, in addition to their annual registration fee. After all, EV owners are well to do, and EVs are among the heaviest passenger vehicles, due to the weight of the batteries. They cause more wear and tear on the roads, even if they are better for the atmosphere. Devote ALL of that increase and the 2015 increases in gas taxes and registration fees to fixing the roads. Period. No "we'll just sneak in an extra 10 cents a gallon for community colleges so we can give all their current funding, plus some to K-12". No more Q1 semi-street cars, commuter rail station studies, bike paths, decorative bridges, or new bus line subsidies out of state gas tax revenue, either. Just fix the roads. My Prius weighs 2513 lbs. A Jeep Cherokee, probably one of the lighter SUVs weighs 4514 lbs. I also pay an extra 30.00 for my registration. Yes. Facts matter. But they're wasted on the GOP crowd ('flat earth', no climate change, etc.). By simply removing the sales tax on gas without any replacement revenue you're shorting the school aid fund by well over $600 million and local governments by about $85 million. There would also be smaller losses to the comprehensive transportation fund as well as a reduction of general fund revenue. The argument that the sales tax on gas should go to the roads is idiotic because it was the public that decided the distribution of sales tax revenue when the Constitution of 1963 and Proposal A were enacted. Those were votes by the public to put the distribution of sales tax revenue in the Constitution. It was never a legislative decision. I am aware of the distribution of sales tax revenue that was set up under Proposal A. And also that Gov. Whitmer plans to re-purpose about $750 million of her proposed new gas tax towards Community Colleges in order to free up the money now flowing to the School Aid Fund from the sales tax on gasoline. That's what I was talking about when I said Gov. Whitmer also needs to quit using "shell games" about funding. The public did not decide to impose a sales tax on gasoline - that was done in 1933 with passage of the original tax on retail sales. But the added 2% being dedicated to the School Aid Fund was part of Prop A's effort to decouple school financing from property values to provide more equitable financing for all schools. Michigan is at the very bottom in regards to govt. transparency but we're #1 on auto insurance rates. It appears we'll soon be at the top in the nation for gas taxes which is govt. desperation at best. FoMoCo and GM are investing heavily into autonomous electric vehicles and maybe not too far down the road we'll be able to go down to the old train depot and actually jump on a train to elsewhere. A gas tax is short term desperation as are toll roads. Peter Lucinda (R) reveals there are about $23 Billion in the no-fault auto insurance catastrophic fund. CF director R. Kevin Clinton says the fund is $1.5 billion in the red. Having looked at the online audit of the fund, no doubt Mr. Lucinda is correct. Restructure auto insurance first to free up money for the roads and schools. No wonder why so many Detroiter's now live in Atlanta. No new taxes. They have enough money coming in. How about better management, more transparency, and accountability. Also the road work is good on freeways, but pothole repair is shoddy at best, the road repair contractors must be held accountable and not be paid until proof of quality completion is done. Stop throwing money at the problem, get your hands dirty and get to work. Again, you don’t need more money you need to get this thing managed by people that know what they’re doing. Forget the gas tax. Add this as a line item to state income tax but put it directly into a seperate fund that can ONLY be used to fix roads. Same for the gas tax. Get all the taxes these lying politicians claim are for special items out of the general fund and into their own budgets. The maybe we can hold Lansing accountable for what they promise and continually fail to deliver. Gasoline prices increased by 35 cents on Wednesday and I didn't hear anybody complaining. This increase was nearly as high as the proposed increase of 45 cents that is raising such a stink. There is no magic involved in fixing roads -- it takes money and long-term commitment or our roads will never improve. $558.00 annually. That's just travel to and from work with little else. Just curious...how many feet per gallon do you get? Do you commute back and forth to Cleveland? Consider an individual that drives 15,000 miles per year and averages 25 miles per gallon, which means the individual is purchasing 600 gallons per year. A $0.45 per gallon increase translates into an additional $270 per year, which is about half of the impact you cite. You either drive much more than the average individual or your gas mileage is substantially lower (or both). If you'd be paying $558 more per year with a $0.45 per gallon increase, that means you purchase almost 1,250 gallons of gas per year (roughly 24 gallons per week). Even at 20 miles per gallon, that's almost 25,000 miles per year, which is well above the average. Averaging 25 miles per gallon puts you at over 30,000 miles per year. I just figured my cost and it's $117. Our household will get hit for well over $1500. Two working adults and an 18 yo will do that. The 15000 mile average includes the seniors who put 50 miles a week on their cars to church the grocery store and the bingo hall. So how do we fix the roads? What is your solution? It appears you don't have one. 'Not this' isn't one. If we are going to increase "gas" taxes then the Republicans are going to have to stop supporting socialism for the "capitalists" by reducing the load limits on tractor trailers and making diesel fuel tax the same as gas. The State fails to collect an estimated $38Billion each year because of tax expenditures (credits, deductions and exemptions). Find the money there! I wouldn't say that the sate "fails" to collect that revenue since some of the tax expenditures are constitutionally protected (such as exempting food and prescription drugs from the sales tax). In addition, there are other tax expenditures that are policy decisions (such as exempting interest on municipal bonds issues by Michigan municipalities from the state income tax). That said, there are any number of exemptions that could probably be eliminated, although each tax expenditure provides preferential treatment for some entity or group, and at that point creating a consensus to eliminate them becomes difficult. I don't necessarily disagree with your approach, but getting it done is much more difficult than just issuing a few administrative bulletins. What make anyone think our existing construction and materials companies have the capacity to absorb an additional $2.5 Bil in spending? They are already working 60 - 70 hours a week during construction season and can't find the help they need even with higher and higher pay. (All those BAs someone was previously whinning about not having aren't going to spread concrete!) What makes anyone think the bulk of any increased spending wouldn't just be largely absorbed by much higher prices? If we try we will spend a lot more to get a lot less. § 9 Use of specific taxes on fuels for transportation purposes; authorization of indebtedness and issuance of obligations. All specific taxes, except general sales and use taxes and regulatory fees, imposed directly or indirectly on fuels sold or used to propel motor vehicles upon highways and to propel aircraft and on registered motor vehicles and aircraft shall, after the payment of necessary collection expenses, be used exclusively for transportation purposes as set forth in this section. So, perhaps the question should be restated as: Should the state re-steal transportation funds from the schools? How about you let the schools have a third of the sales tax on gas and the rest all go to fixing the roads? Proposal A increased the sales tax from 4% to 6% and if I remember correctly the increased 2% was going to be earmarked for schools. If we just applied 4% of the 6% sales tax on gas to the roads until 95% were satisfactory, then we could look at other needed infrastructure improvements or revival plans for the state. Too much of the state requires people to own a vehicle to get to work or go several miles by foot and/or bike. Why not try earmarking 4% of the 6% sales tax on gas to fixing the roads and see how much that helps with fixing the roads, before additional taxes that will hit the lower wage workers, including food delivery workers the hardest. If gas taxes goes up will people tip the delivery people more for their expenses, I am doubtful. Big picture allocate the funds that way they are suppose to be or more people will look to a ballot proposal to remove the gas sales tax on gas and Lansing will have less money to manipulate to their preferred areas. Once again we all understand the roads need funds for repair. However we voted 3 to 1 against the simple approach "lets raise taxes of whatever combination" just a few years ago. It did not matter what method of tax increase it would have gone down just as hard. As a result in 2015 our legislature cobbled together pieces of tax increase and commitments to find new funds, perhaps not enough but it is only now starting to be available. And lets be real here, the main reason the Governor is shooting for this goal right away, is to take advantage of the "crisis" and free up the funds she wants to spend on her other priorities, ie: special interest group supporters. Such as the sales tax on gas that goes to schools, the increasing portion of general fund revenue the 2015 act requires, etc. Most of us can see through this full court press by all her supporters and beneficiaries of all the new money. We know we are expected to understand that it's good for us, never mind it's not what we were told we were voting for. Pretty sure we aren't going to fall for it this time. I believe that until Michiganders understand the State Revenue and how it is distributed, this issue will remain stalled. Citizens need information about where their tax dollars are spent now. What are the priorities and is there discretionary money that is still available. The current legislature has only talked about tax cuts. Citizens may think there is already enough money to fix the roads.